The aim of this guide is to provide information on the effectiveness and possible disadvantages of using supplementary / diversionary feeding as a management tool. (v) Maintain a nucleus of good resident stock. The effectiveness or cost-effectiveness of feeding is difficult to gauge. Evidence from studies of the effects of feeding is either inconclusive or contradictory (see below). Feeding is also likely to be a time-consuming and expensive undertaking. Anecdotal evidence suggests that by using feed to encourage stags to new wintering grounds in non-sensitive areas, impacts can be diverted away from more vulnerable areas. 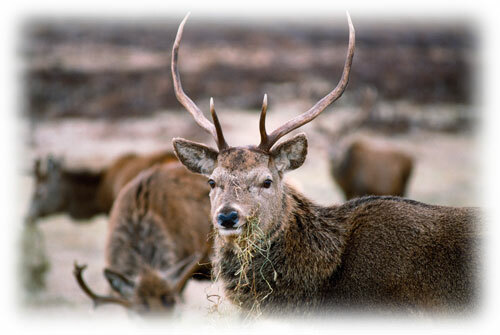 Generally, however, it is considered that feeding is of little benefit to open range populations of wild red deer in Scotland. The decision as to whether to use supplementary/diversionary feeding should therefore be approached with caution as the potential disadvantages may outweigh any perceived advantage. Food Hygiene Regulations require that any feedstuff supplements provided to wild deer destined for human consumption must be recorded and this information passed on to the final processor. Venison marketing relies on the reputation of venison as a wild, natural product. Practitioners should give consideration to the risks to this reputation if providing feed to wild deer. Encouraging growth of young shoots by mechanical topping or careful burning of chosen areas of natural unimproved grassland, or heather. The feeding of mineral or urea blocks (such as Rumevite) may be considered. Their purpose is to increase the digestibility of what natural forage is available overwinter, so increasing the nutritional value derived from it. As such they may have some benefit in refocusing deer activity or maintaining higher condition. As blocks are small, portable, can be distributed over a very wide area among natural forage and do not in themselves constitute a direct food source, they suffer few of the disadvantages of feeding at regular feed sites. In the absence of this expected feed local environmental damage may be experienced. Ideally therefore, feeding should be withdrawn gradually over a period of some years by reducing the amount of food provided and by spreading the feed over a number of sites. The effects of feeding have been studied in the UK and abroad. Evidence from these studies is summarised below. However, it should be noted that these are the effects (or non-effects) of feeding at extremely high levels (i.e. approaching 80% of maintenance or more). Most of the feeding taking place for red deer in the open range is likely to be offered at lower levels. Feeding of red deer stags on open range appears to have relatively little positive effect on body weights or may even be negative, causing weight loss. Effects on antler size and quality are variable. Feeding may contribute to an increase in antler quality if mineral-loaded feed is provided on otherwise mineral-deficient ground. In hinds, there is little or no evidence of a positive effect on hind body weight or fecundity, and there may be a counterproductive effect particularly on younger animals (calves/yearlings). Evidence for effects on survival is ambiguous. For feeding to be effective in reducing mortality, high levels of feeding need to be maintained over an extended period (October to March/April). There may be little effect if feeding is delayed, until animals are already in poor condition or as a response to heavy mortalities already being experienced. The effectiveness of feeding as a management tool for preventing environmental impacts, particularly damage to native and commercial forestry, is inconclusive. Where some studies show a decrease in damage, others show either no effect or a significant increase in local impacts. There are a number of possible disadvantages associated with feeding. Animals may develop a reliance on the food provided and reduce their intake of natural forage to near zero. If the feed provided is less than 100% of their daily requirement, these animals may lose, rather than gain condition. Feed uptake may be extremely uneven at feeding sites caused by the most dominant individuals keeping others away. Feeding sites should be separated for males and females if possible and numerous small feeding stations widely distributed over the entire area. Even at small stations ideally there should be some variation with some feed deposited in feeders, troughs and small dumps on the ground. Creep-feeders will allow access by calves. Although provision of feed may be successful in holding deer in an area, given the potential for loss of body condition, it is essential to ensure that adequate shelter is available. 1 Supplementary winter feeding of wild red deer Cervus elaphus in Europe and North America: justifications, feeding practice and effectiveness. R. J. PUTMAN* and B. W. STAINES Mammal Rev 2004, Volume 34, No. 4, 285–306. and Wildlife Biology 20(6):326-334. 2014.